The Kingpin is back, and you will be glad! Summer is fast rolling in, and this is the time for beaches and fun in the sun! Woot, woot! If there's on thing your glorious Kingpin loves about a beautiful sunny day, it's a bodacious backyard barbecue to go with it! Think of it: you're stepping out onto the patio, cold beer in hand. You can smell the delicious aroma of steak sauce and charcoal in the air! The neighbors are coming over... is Gloria bringing her potato salad?! LORD PLEASE HAVE HER BRING THAT SALAD! Maybe your best bud, Jimmy has some of that custom brew he's been working on... make sure to invite him too! Now if you could only remember... where are the tongs?! Where... are the... bloody... to--LIGHTS OUT. You've succumbed to heat stroke, pal. You know why? Cuz' it's super hot out in the summer sun these days and you were too lazy to bring out that old party tent you picked up a few months back that's just begging for some time out of retirement! Sure, it may have needed some maintenance and TLC, but if you had only set it up... maybe you'd still be up and about, chilling in the shade like it's going out of style, sipping on that beer and planning the rest of your barbecue to perfection. Instead, you're gonna be a stroke victim in the terrible summer heat and you've got nothing to show for it other than a pair of tongs... that you lost! Having a party tent is like having accident insurance; it is good to have even as you hope you won’t need it. Even if you are able to predict rain from watching animals or observing cloud formations, the most warning you will get is two days before. That is way too late to call off a party. You do not have to resign yourself to having to cram everybody into your living room. A party tent will let you enjoy your birthday party even if it rains. PROTIP FROM THE KINGPIN: One of the best of backyard birthday party ideas is to put up your party tent several days before the event so that even if it rains before the day, your party area will stay comfortably dry. 2. It might not rain. A party tent provides shade, a must-have on sunny days. You may have been dreaming of getting a tan after being cooped up indoors all winter, but even if it isn’t very hot, you still need to protect yourself from those bad ole UV rays. You are supposed to get party favors when you go home, not skin cancer. A party tent with no sidewalls is the ideal setup for backyard bbq and booze as it lets in the breeze to keep from getting too hot. 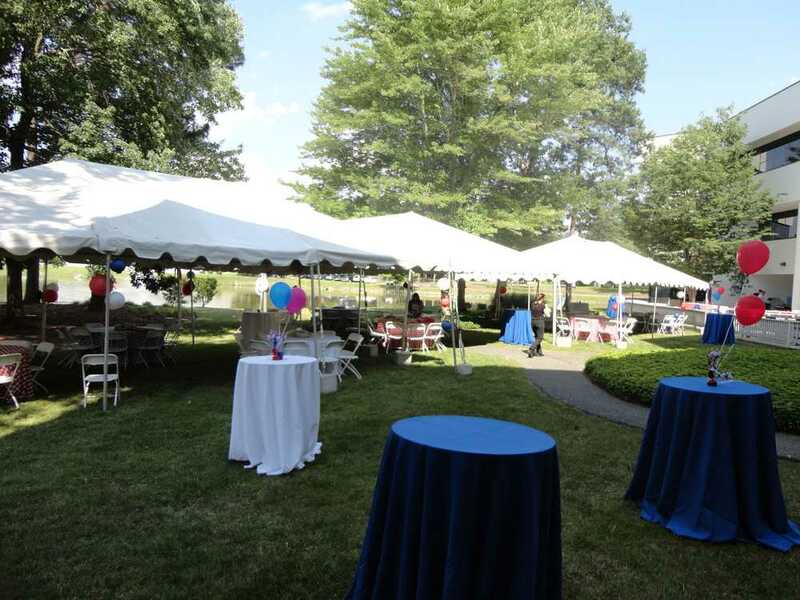 You can also set up air-conditioning if your party tent is fully enclosed. Important note: Make sure that you aren’t trading UV exposure for carbon monoxide poisoning. If your party tent has sidewalls, do not do your actual grilling inside the tent. It doesn’t matter if it is gas-fueled or coal-fired; grilling releases carbon monoxide into the air. Unless the tent is really large and well-ventilated, you could be slowly killing your guests. 3. A tent keeps people outside. Keeping your guests comfortable outside gives them no reason to go inside the house. Set up a small pool outside to keep kids occupied and tempt them away from computer games. You can have a changing room for when they get tired of the water. You can also set up an area with pop up tents for a makeover, henna tattoo, or face painting. You will keep your house nice and clean, and your guests happy and content. 4. You have more decorating freedom. You may have a chockfull of small backyard design ideas, but party tents give you a more convenient canvas to work on. You can hang lights, streamers, and curtains to your heart’s desire without it looking overdressed (or getting wet). It would make carrying out a theme so much easier. A party tent would be on the top of a list for backyard engagement party ideas. 5. You can execute more activities. You can set up a dance floor where you can plan parlor games during the day for the kids and set up sound and light equipment. You can set up a piñata or grab game even if you don’t have a convenient tree. When the sun goes down, you can get more creative with backyard party ideas for adults such as drinking contests or simply dancing. 6. A tent forces people to herd. Unless you have a tiny backyard, most people tend to drift into small groups in different corners of the backyard. A party tent brings the group together and makes a party more sociable, especially if the people don’t know each other that well or haven’t seen each other in a long time. A good example of such events include family reunions and weddings. 7. A tent protects the food. The open air may be good for people; not so much for food. A tent keeps leaves, twigs , animals and bugs from crashing the party. In addition, a bbq party is not all about just the bbq. You will have sidings and salds that will have to kept out of the sun as well, unless food poisoning is part of the festivities. You can erect a pop up tent over your built in bbq grills as well. Backyard bbq parties are fun and easy ways to celebrate any occasion, even if they are basically formal ones such as a wedding. There are so many ways that you can plan a fabulous one without breaking the bank. You can take this to a higher level if you have built in bbq plans that include your party tents. The 9 reasons above leave no room for doubt. There is no use arguing; the Kingpin knows best. and unlock 2 more reasons for nothing else than a mouse-click. 8. You can create sections. If you are planning a big party with distinct backyard bbq menu ideas, you can use pop up tents to distinguish one cuisine from another. You can have Mediterranean in one tent, Asian in another, and so on and so forth. It would be great if you are using old country bbq pits, but make sure that you do your actual grilling outside the tent to keep grease from accumulating on the underside of the tent. For a wedding, for example, you can separate the registration and gifts area, the photo booth and the main party area. 9. It keeps the noise level down. BBQ parties tend to get noisy, so a party tent can bring it down to a dull roar and keep from annoying the neighbors (or attracting bears). Seriously though, sound actually tends to travel faster upwards into the air than straight across a party floor, through several obstacles. If you have any grumpy neighbors that may be relaxing on a second floor (that weren’t invited to your BBQ, you jerk), a tent will certainly help subdue the noise of your party underneath. It’s science, folks… it don’t lie. As per the usual, the Kingpin has gone balls-out with the research and has found you some awesome backyard barbecue infographics... remember to check out the sites embedded within the images if you like the research they've done. Infographics are sweet but they take a lot of time and research to make! Great job guys! Backyard BBQs are an American tradition and are loved the world over. There are even stats to prove it! Check out this research data on the almighty American pastime--the classic backyard BBQ party! Summer really is just around the corner and you should be preparing early to make sure all your get-togethers go off smooth, without a hitch. Here are some great tips on how to make your patio the perfect summer backyard barbecue hotspot. This last one is not about BBQs per se but it only proves how important backyard barbecues are for the average American family. Check out these pointers on how to make the "ideal" backyard.